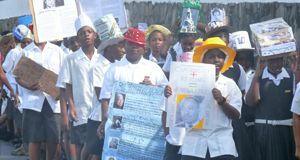 They then settled at the Petersville School, where the children showcased their many talents through song, drama and poetry. The Hats off to Reading performances included all classes from Prep 1 (Kindergarten) to Grade Five and were lauded as excellent by teacher and coordinator of the event Christine Martin. The students put on various performances, most of which showcased what they learnt in the classrooms throughout the year. The children recited poems about the importance of education, demonstrated their knowledge of Spanish through Spanish songs entitled âMi Familiaâ and a dramatic presentation: âAl Mercadoâ (At the Market). They also performed a number of educational acrostics and a presentation on the past and present leaders, including those from St. Vincent, the United States of America and Africa. Speaking to Searchlight, coordinator of the event Christine Martin expressed how pleased she was with the childrenâs performance in the extravaganza. âI think it was good. The items were very rich and educational. You see the many gifts and talents of the children – from Prep 1 to the fifth grade,â she said. According to Martin, it took just one week to organize the event, a task she admits was very demanding. She, however, thanked the teachers and parents for their support and urged them to continue supporting the children in their reading, as, according to her, reading is the only way to knowledge. âIf there is a lack of knowledge, the whole nation can be destroyed,â she added.